Stop dropped calls in offices and commercial buildings by boosting the cell signal for spaces up to 500,000 square feet. SureCall cell phone boosters for office and commercial buildings improve voice, text and 4G LTE data signals for every US cell carrier. What is a Cell Phone Signal Booster for Office and Commercial Buildings? In offices and commercial buildings a cell phone signal booster can provide everybody inside the building with reliable cell signals for all US carriers and devices. 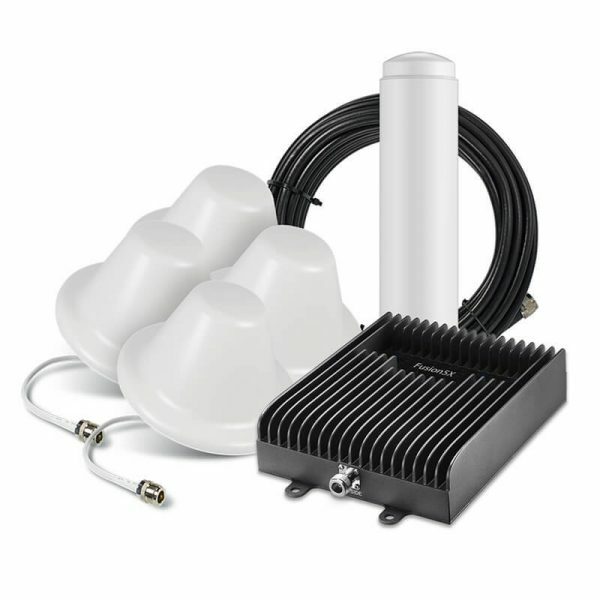 Signal boosters require no recurring fees, can be easy to install for small spaces, and are used across the US to boost weak voice, text and 4G LTE data signals for reliable cell service in small and large offices and commercial buildings. How Do Cell Phone Boosters for Offices and Commercial Buildings Work? Offices and commercial buildings with no cell signal inside and weak but usable signals outside or nearby the building can improve the cell signal inside by installing a SureCall signal booster. Cell phone signal boosters use an outside antenna to capture the signal that exists outside of the building, a signal booster that strengthens the signal’s strength, and inside antenna(s) to distribute the improved cell signal throughout the inside of the building. Cell phone boosters are used to stop dropped calls and fix weak signals in offices and commercial buildings up to 500,000 square feet. Any space with a weak cell signal can benefit from one of SureCall’s powerful cell phone signal boosters to improve cell signals for all carriers, all cell phones and devices, and with absolutely no recurring fees after purchase. Selecting the best cell phone signal booster for an office or commercial building will depend on a few things – size of the building, strength of the signal outside of the building, density and number of walls in the building, price, number of carriers, and satisfaction suite of the manufacturer. SureCall signal boosters work with all cellular carriers in the US to boost voice, text and 4G LTE data in offices and commercial buildings with any wall density up to 500,000 square feet. As long as there is a usable cell signal outside of the building one of our boosters will be able to boost the signal with the best price-performance value of any booster on the market and a Customer Satisfaction Suite that provides SureCall customers with a 3-year warranty, 60-day money-back guarantee, and lifetime US-Based technical support.